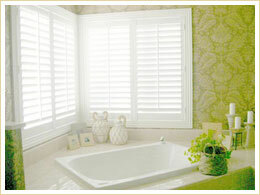 Plantation Shutters : Cheshire, Manchester, Liverpool and Staffordshire. Let’s dive in and briefly and discuss how color influences are lives, our moods, and what colors we can bring into our homes to compliment our personalities and lifestyles! Active Colors: On the warm side of the color wheel we have active colors which include yellow, orange, and red. These advancing hues step out in the room to greet and sometimes dominate. They are great for inspiring conversation and creating an upbeat atmosphere. Red, the most intense, pumps the adrenaline like no other hue. Small doses of fire engine hue wake up an entry or turn up the heat on a hearthside den. Golden or lemony yellows — good for home offices and kitchen unleash creative juices. Passive Colors: The cool colors — blue, green, and purple — will sooth and relax while remaining quiet and calm in the background. These colors are ideal for personal retreats and places of refuge such as your bedroom or other places of refuge. If however, you live in a colder climate, it’s always a good idea to toss in a little contrast, such as a sunny yellow for warmth. Neutral Colors: Brown, beige, gray, white, & taupe neither activate nor pacify but they combine and cooperate with one another bridging together different rooms and colors making a subtle quiet decorating statement. Of course you will discover the darker the color the more striking the statement & the lighter the color the softer the statement. 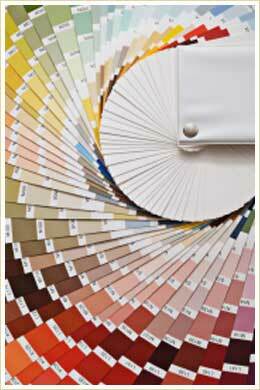 Paint is just the first place to infuse color and every step after that is another way to incorporate color in your room, layer by layer, upholstery, fabric, rugs, windows, wood products, lighting, accessories & plants. How Do Colors Effect Sales? Helping Clients See The "Big Picture"
Don't only take our word for it.